They live in Lily Lake. 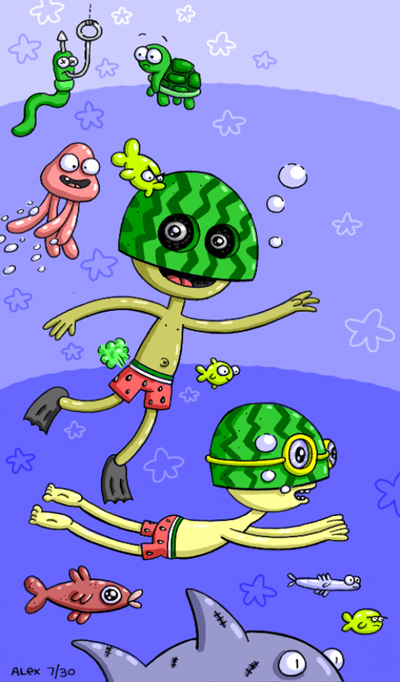 The Watermelon gives them the magical power to breath underwater like an aquatic!. They like to eat Turtles, Turtle Poops, and Fish. Sometimes they catch fishermen, pull dem out da boat, and eat them too! “Ahhh! Ahhh! Nooooooooo!” say the Fishermen as they are eaten alive by The Watermelon Boyz!